Adobe Analytics is part of the Adobe Marketing Cloud and can be used to analyze your customer data. You can view where your visitors are coming from, what days they come the most frequently, and how long they’re staying as well as several metrics based on e-commerce data, CRM attributes, engagement, etc. 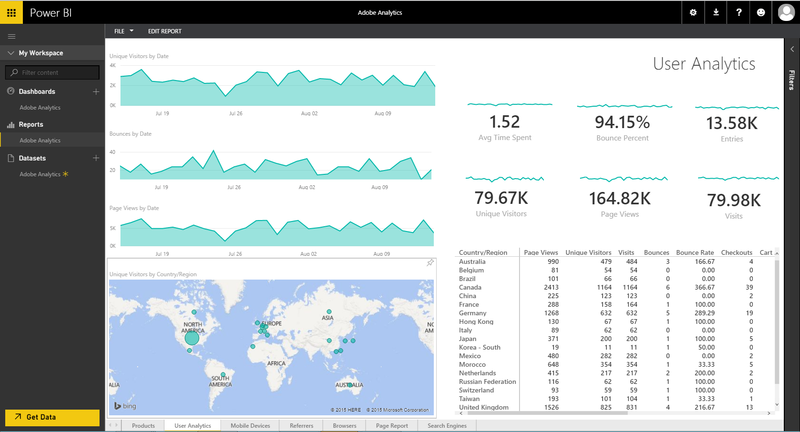 Now you can use Power BI to monitor, explore and visualize your Adobe Analytics data. With an out-of-box content pack, you can connect and discover insights from your data immediately. 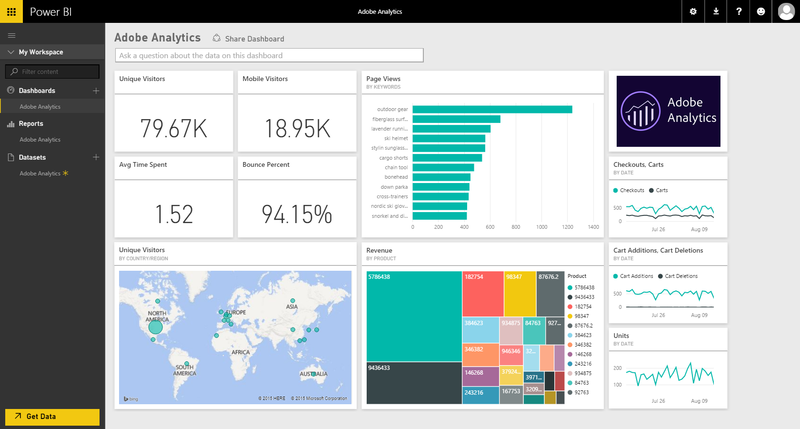 This post will explain how the Power BI content pack helps you explore your Adobe Analytics data. For additional details on how to get started, please see the Adobe Analytics content pack for Power BI help page. After connecting with your Adobe Analytics account, your data will start to load into Power BI and you’ll be notified when your dashboard is ready. Selecting one of the tiles on this out-of-box dashboard will drill into the 7-page report built on top of the data set. For example, if you click on the Unique Visitors Map, it brings you to the User Analytics report. Each visualization was chosen to showcase unique insights and highlight important metrics about the data. You can hover over the visualization to see more details. On this report there are many different insights including the average time spent on the site, and the number of page views. Clicking on one of the countries changes the view to filter for data specific to that country. Any of the visualizations from the reports can be pinned to the dashboard by hovering over it and selecting the pin icon. Add new tiles and move existing tiles around to customize your dashboard to better suit your unique needs. You can also switch to Edit mode while in the reports to view all the fields available. This allows you to edit or add additional visuals to customize your reports and dashboards. After the initial import, the dashboard and the reports continue to update daily. You can control the refresh schedule on the dataset. With the Adobe Analytics content pack for Power BI, you have an initial set of metrics and customer insights enabling you to explore your data even further. We’re always interested in hearing your feedback – please contact us at http://support.powerbi.com to let the team know how your experience was and if there’s anything we can do better. We look forward to your feedback!